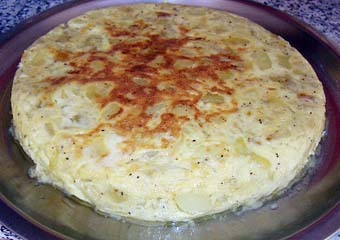 The Spanish tortilla is one of the traditional egg dishes in Spain. 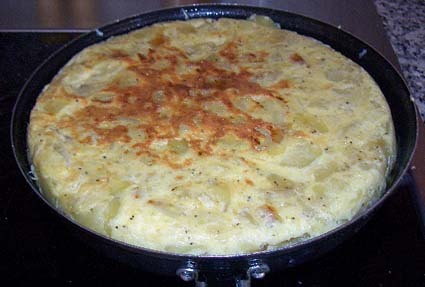 It looks more like a thick, juicy egg-and potato cake in comparison with the French equivalent, the normal omelet. There are many regional varieties of tortilla. The recipe below is the traditional. Enjoy! I use tortilla in many ways. 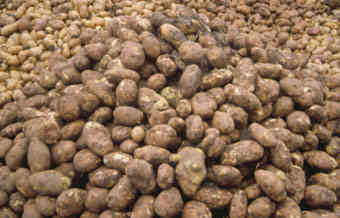 As a complement to meat and fish instead of rice or normal potatoes. Cold cut on a sandwich, or like the Spaniards; a piece tepid tortilla, baguette and a glass of beer or dry sherry. 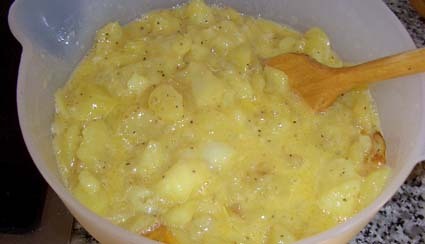 Peel and cut the potatoes into thin slices or cut in cubes, chop the onion coarsely. Heat slightly more than 2/3 of olive oil in a frying pan, preferably made of Teflon. 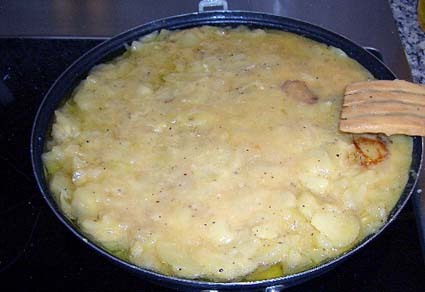 Cook the potatoes and onion slowly on medium heat without letting it take color. When the potatoes and onion are soft, use a cullender and drain it. Beat the eggs in a large bowl and season with salt and pepper. 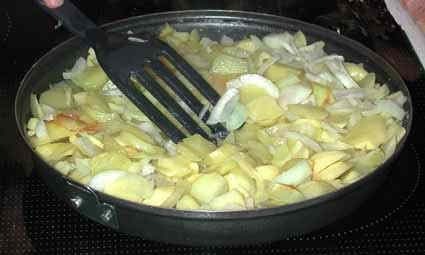 Add the drained potatoes and onion in the bowl and stir. Return the pan to low heat and add two tablespoons olive oil. Add the egg- and potatoe mixture and spread it out even with a spatula. Shake the pan to prevent the tortilla to stick. Neaten the sides with the spatula to build up a deep, straight edge. After a few minutes when the tortilla has taken color comes the difficult moment, to turn the omelet. This is easiest done with a plate larger then the pan. Put the plate on top of the pan and do a fast turn so the tortilla ends up on the plate. Add a little more oil in the pan and let the tortilla slide down to cook on the other side. Neaten the sides again. Don't overcook the tortilla, it should remain juicy in the center. Place the tortilla on a serving dish. Serve warm or cold in portions, or as a complement to the drink, in bite-sized cubes, pierced with a toothpick. town Nájera, La Rioja. Enough for making tons of tortilla.